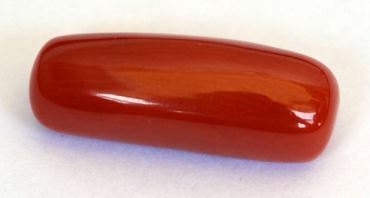 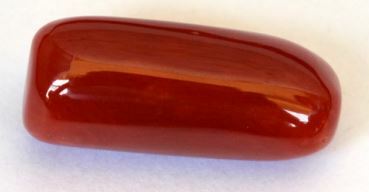 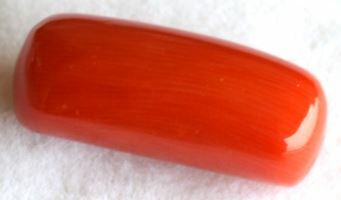 At Heerejawharat.com we have large collection of blood red coral (lal munga). 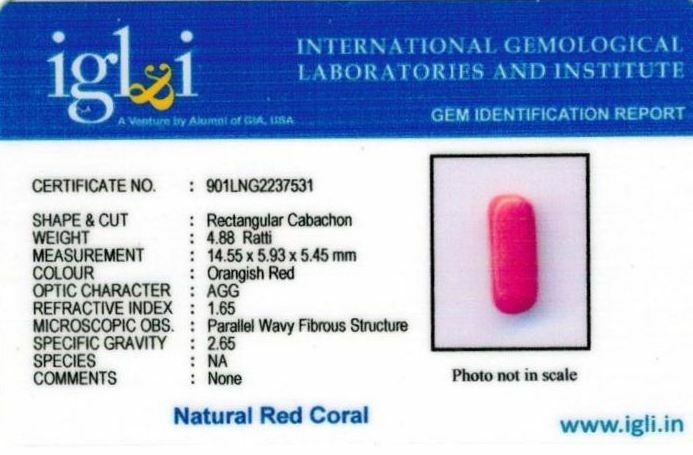 All our red coral (lal munga)s are natural, unheated, untreated and shipped with original lab certified. 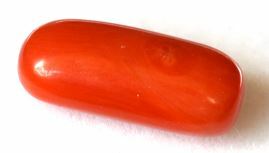 Who Should Wear An Astrological Red Coral Gemstone? 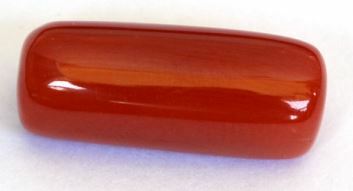 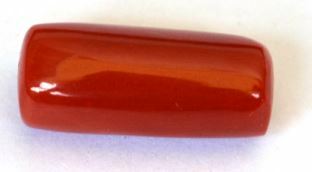 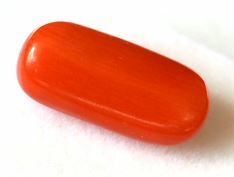 Red Coral is the birthstone for Aries sunsign (20 March – 19 April). 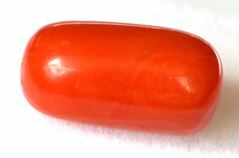 In Vedic astrology, Moonga stone strengthens Mars (Mangal) planet and is the rashi lord for Aries (Mesh) and Scorpio (Vrishchik). 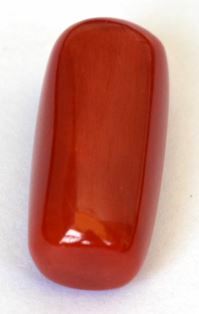 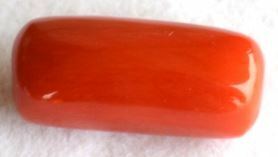 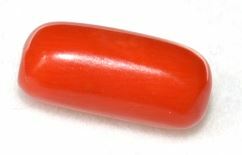 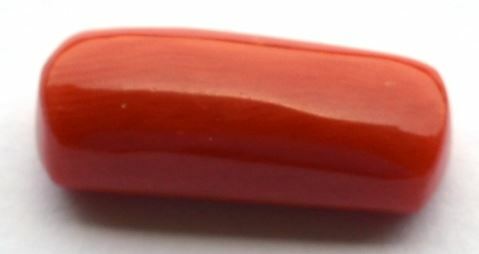 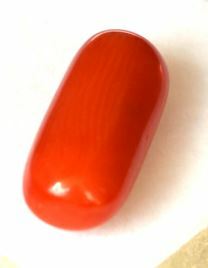 Red Coral stone bestow's the powers of Mars on its wearer and brings him strength, stamina, confidence and good health. 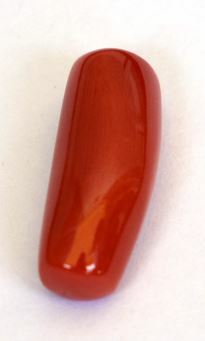 Red coral also signifies blood in human body, so people having blood problem can wear red coral. 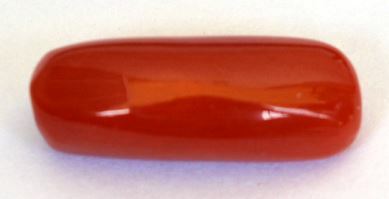 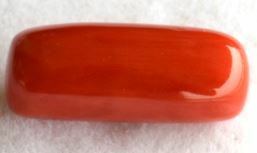 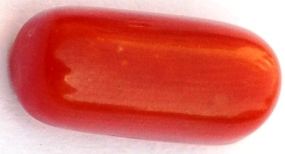 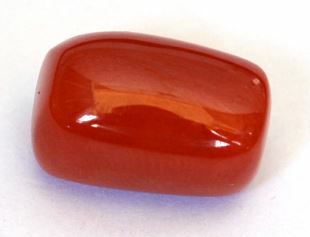 Ascendants of Sagittarius, Pisces, Leo and Cancer can also wear a Red Coral gemstone. 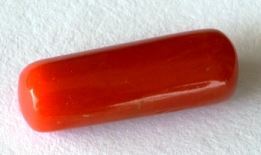 Which Red Coral Stone Should I Buy? 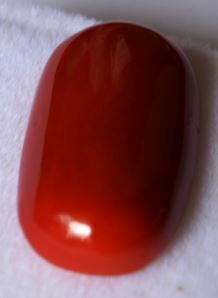 The stone should preferably be free of spots, orange to deep red in color and have no chemical or heat treatments. For Astrological purpose, Italian Red Corals are considered to be the best Red Corals. 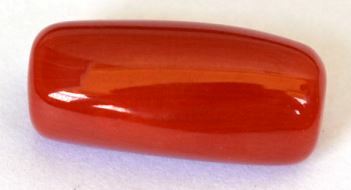 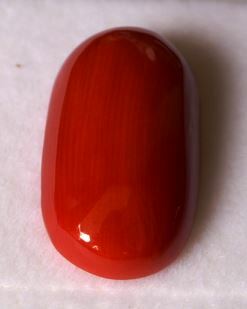 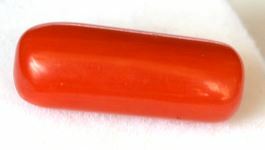 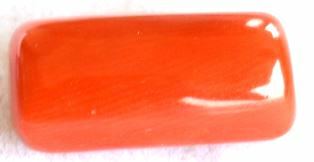 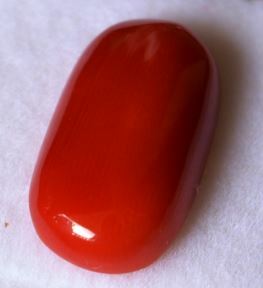 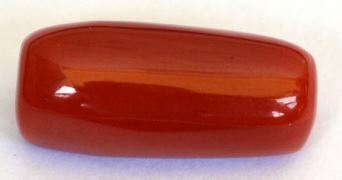 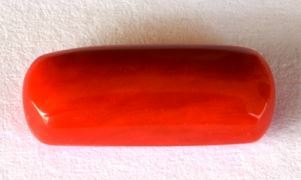 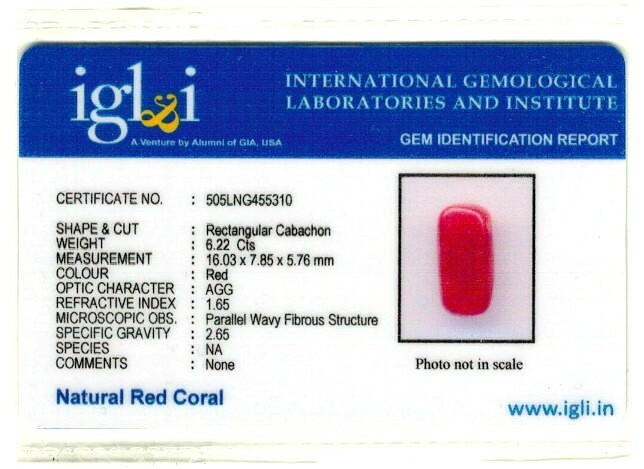 In general, Our Blood Red Color Natural Italian Red Coral prices in India ranges from Rs. 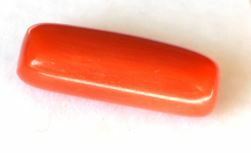 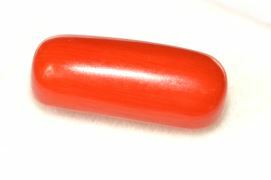 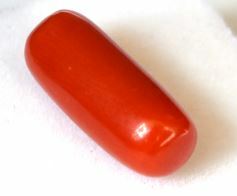 500/carat to Rs 1200/carat, these are best red coral stones for astrological purpose. All our Red Corals are natural, untreated, unheated and shipped with original lab certified. 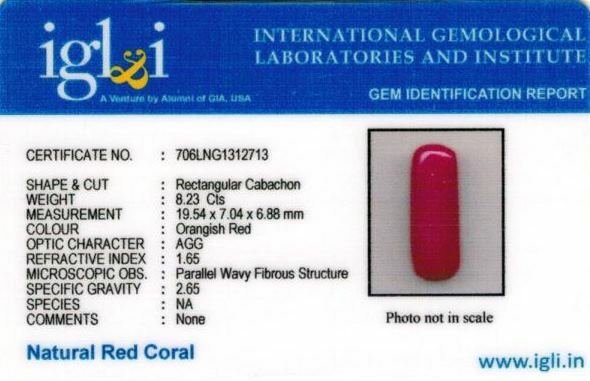 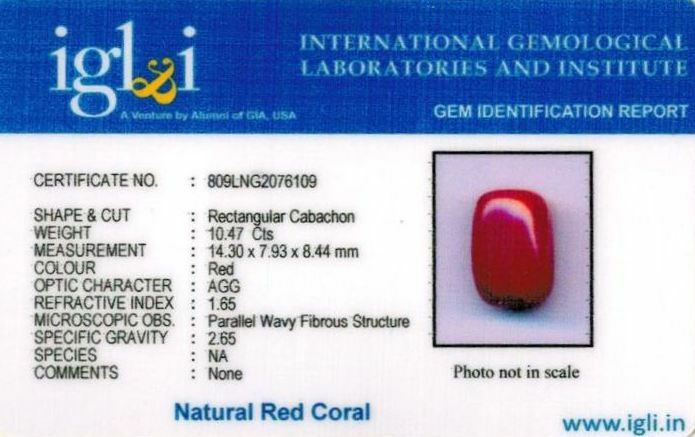 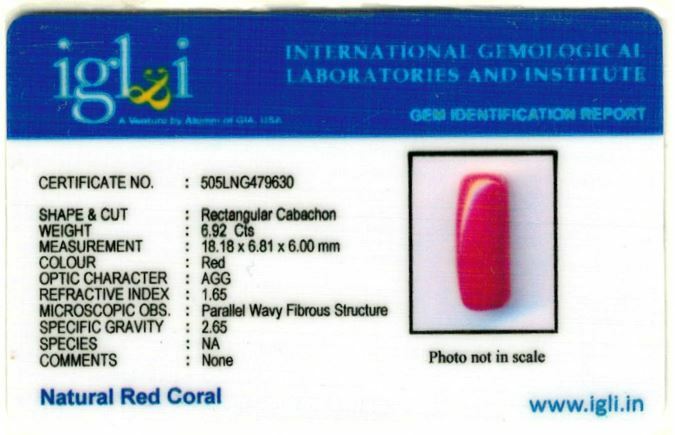 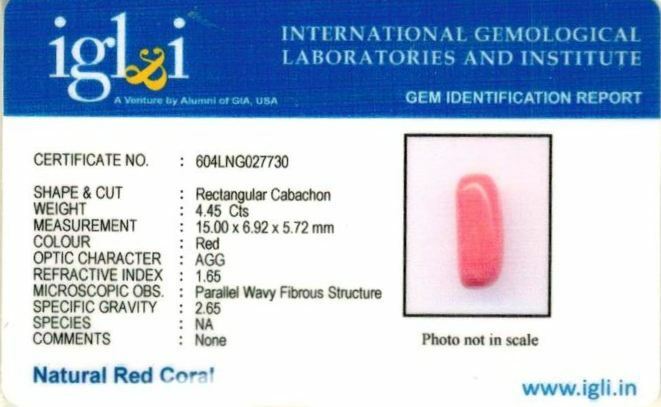 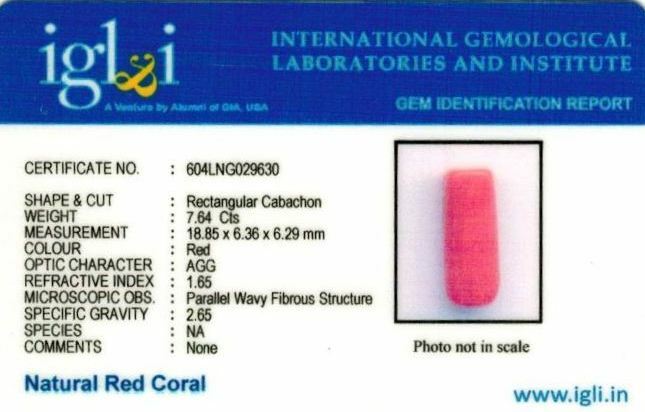 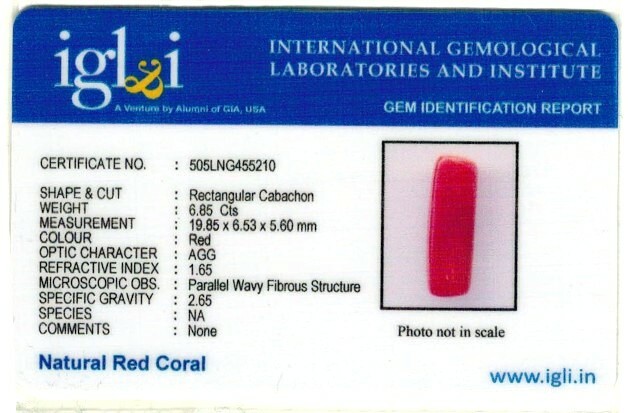 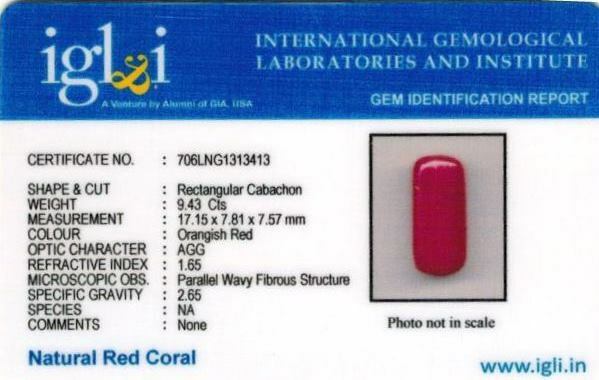 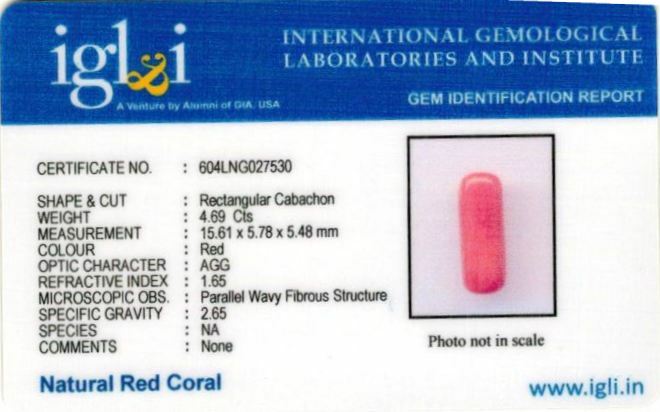 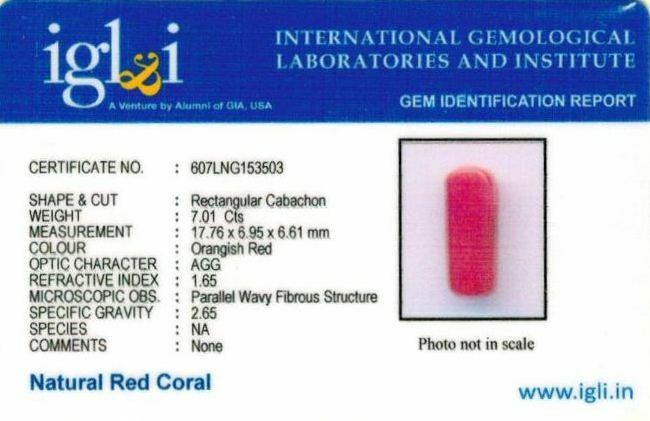 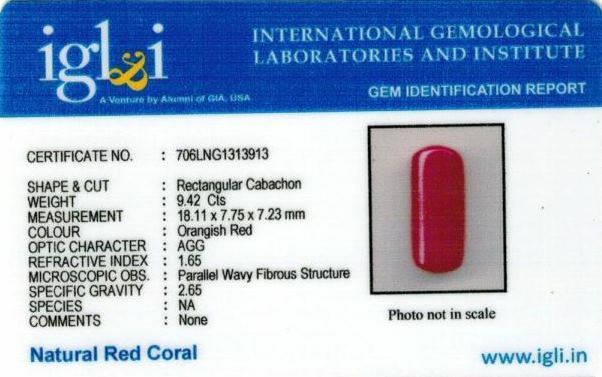 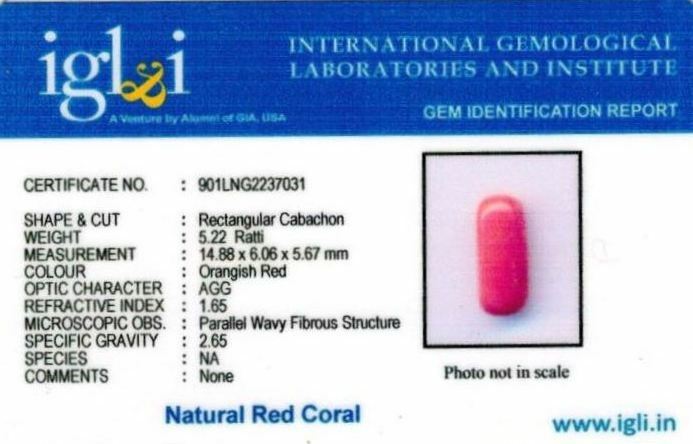 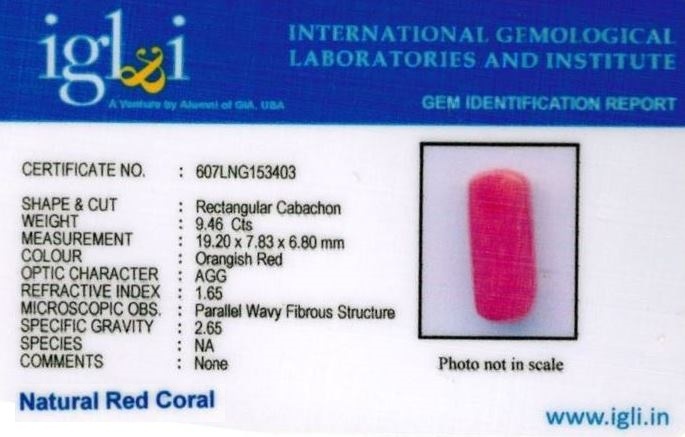 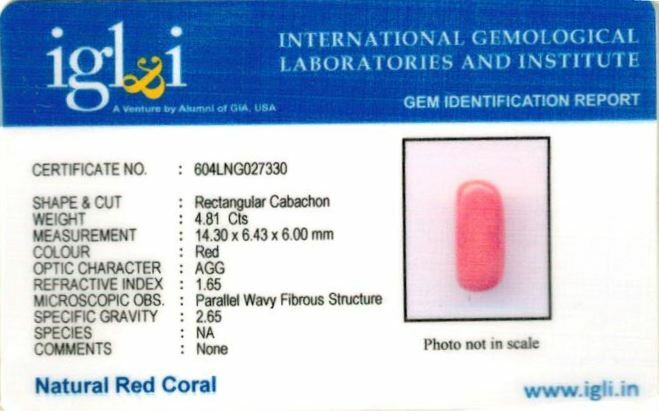 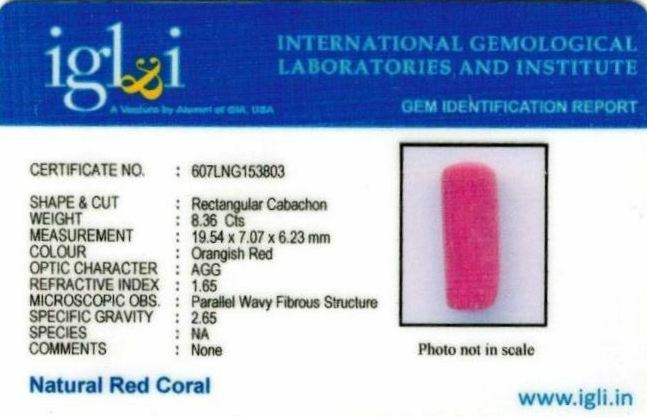 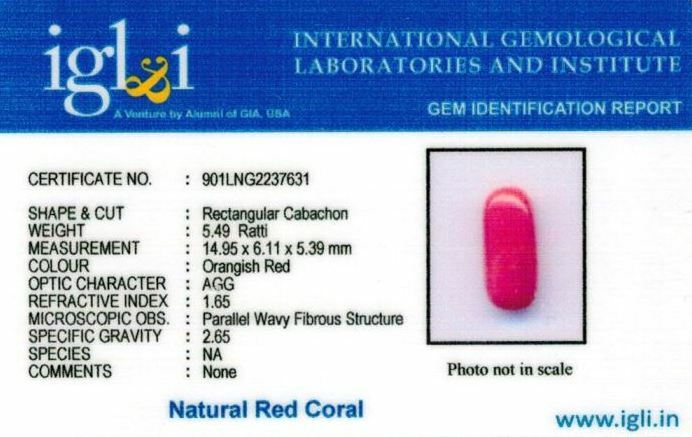 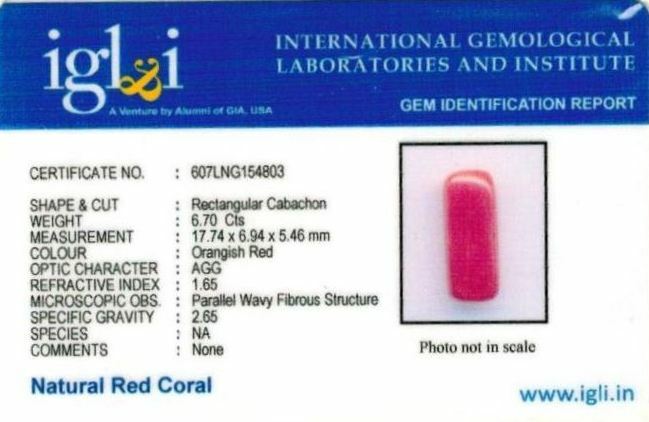 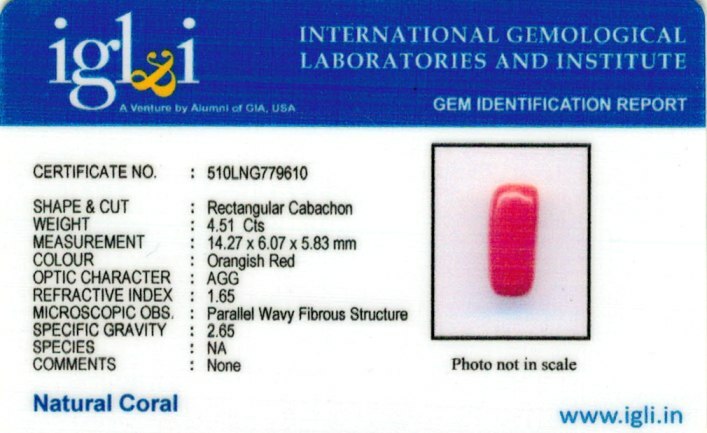 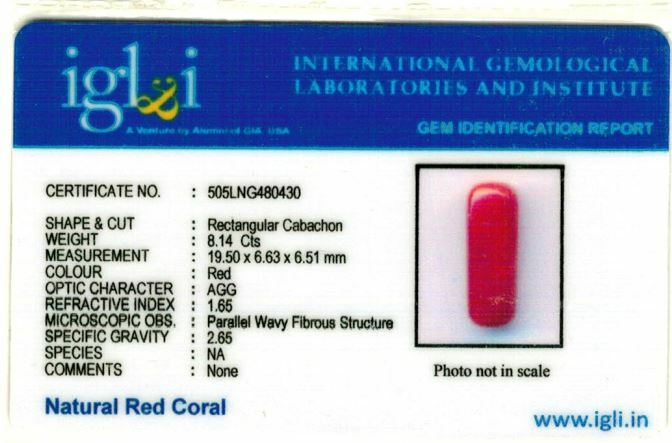 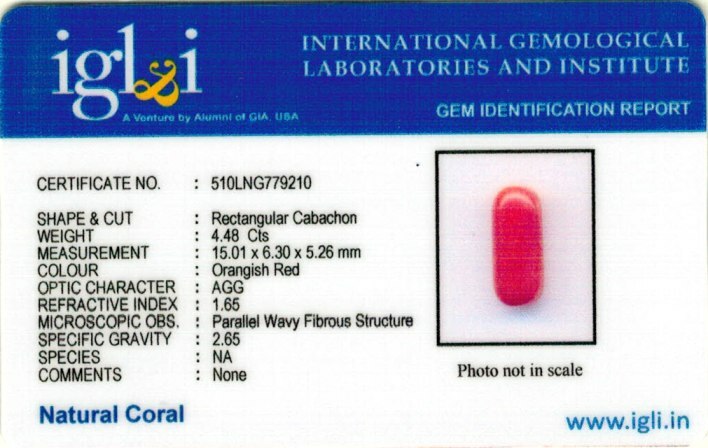 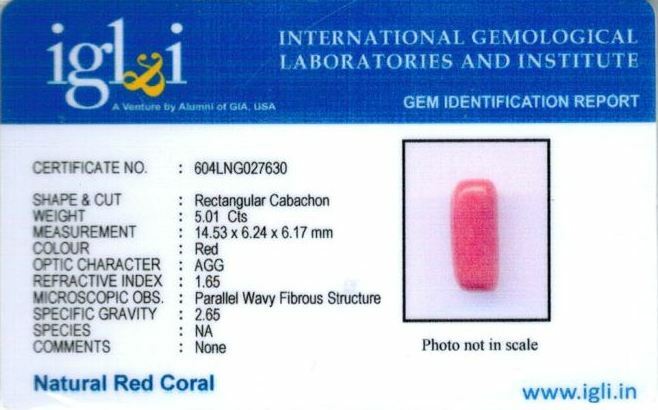 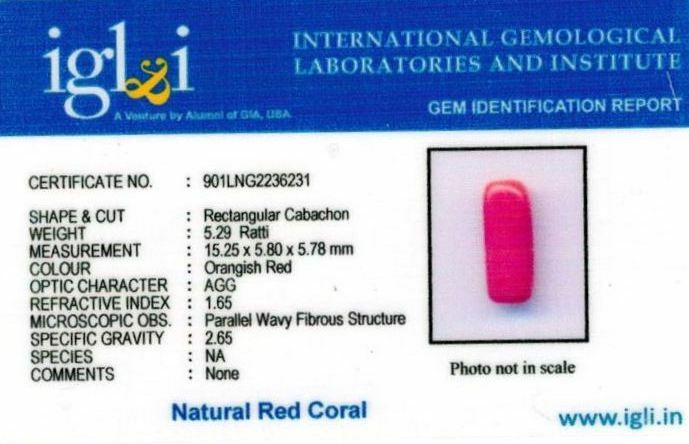 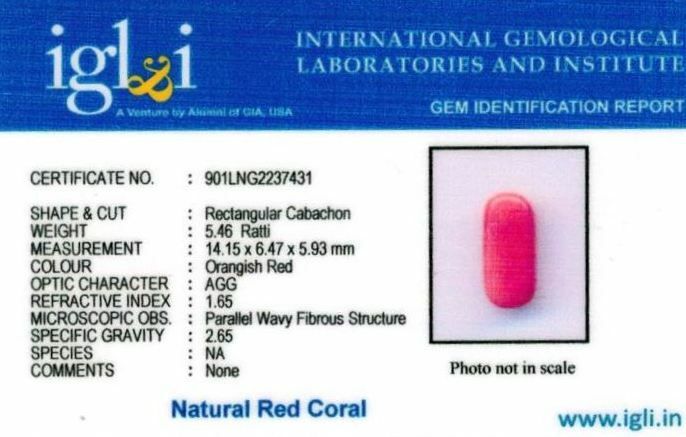 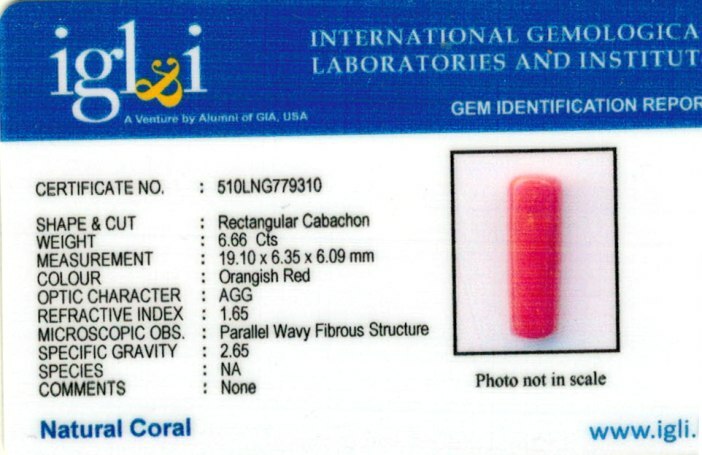 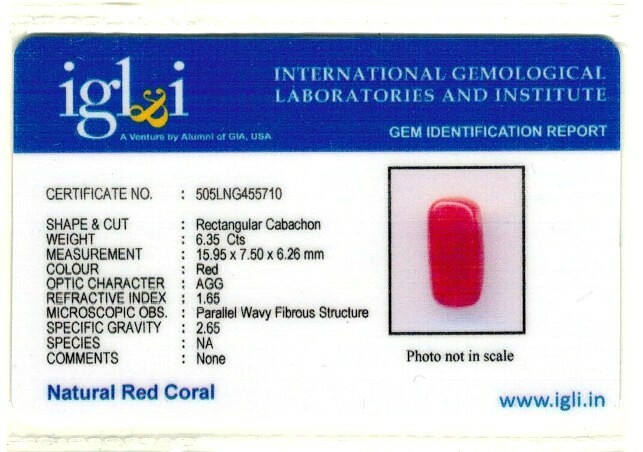 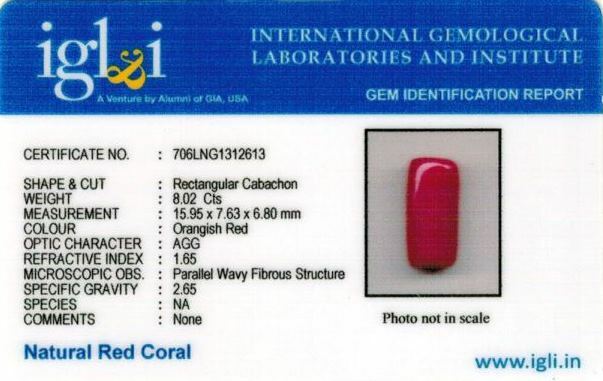 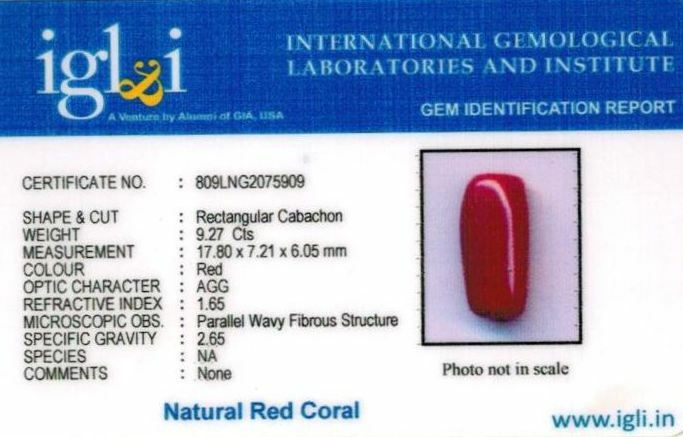 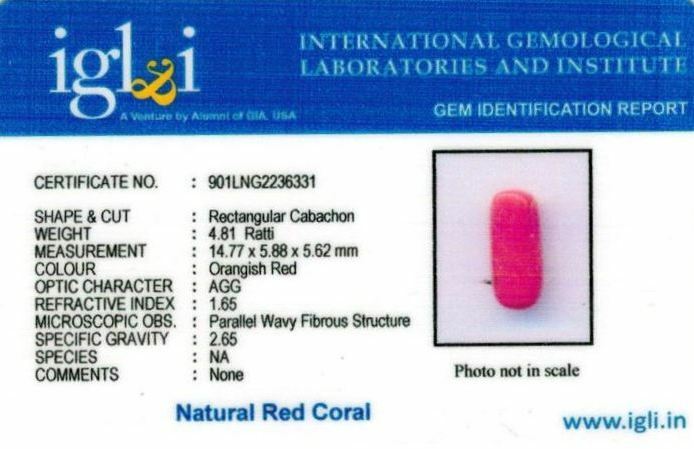 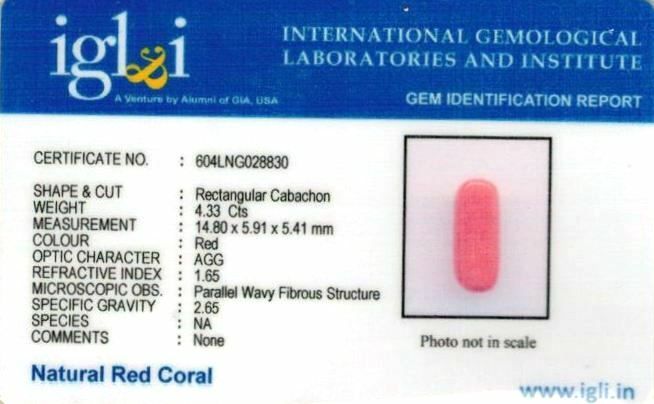 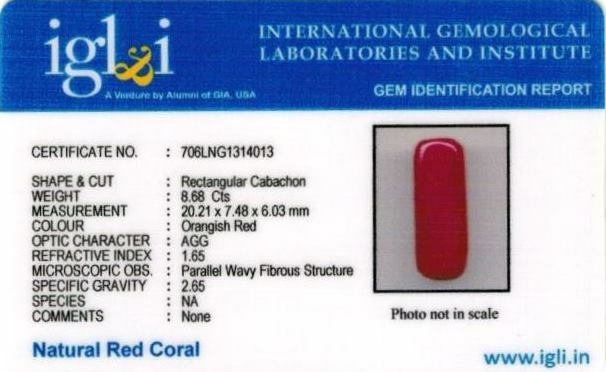 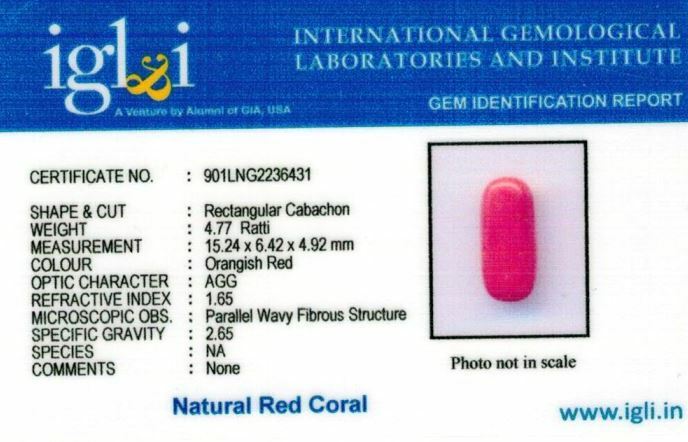 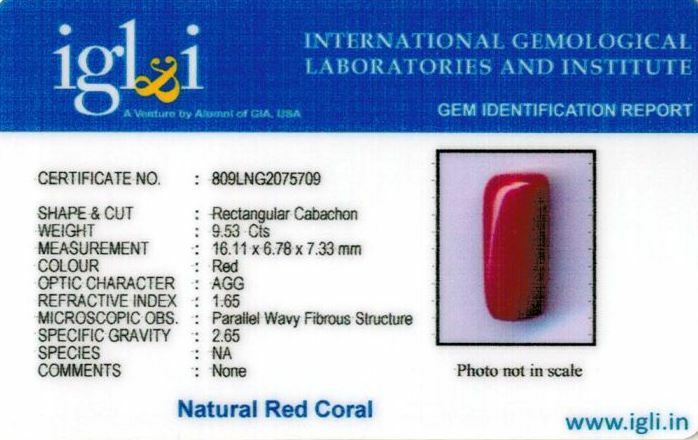 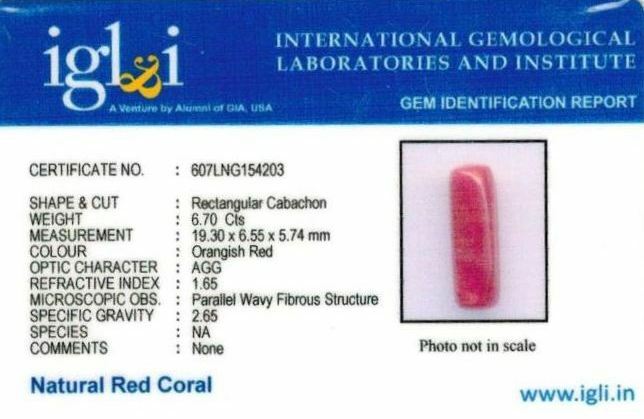 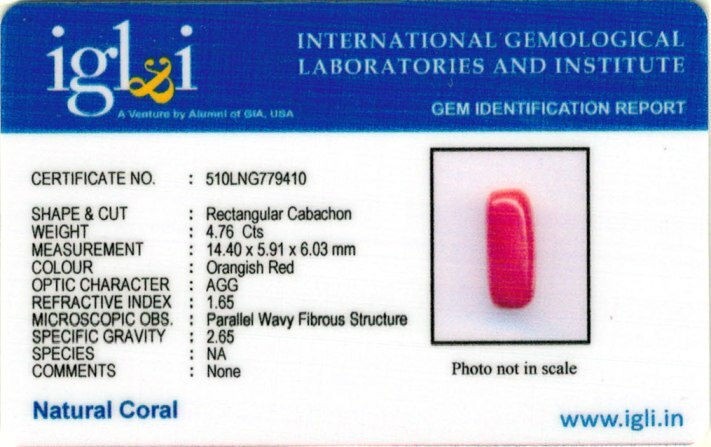 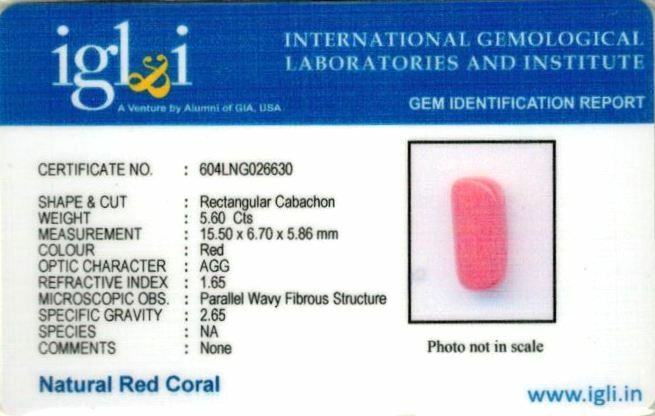 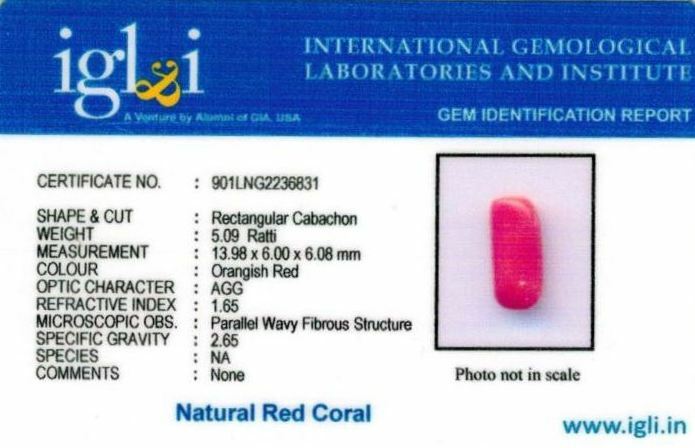 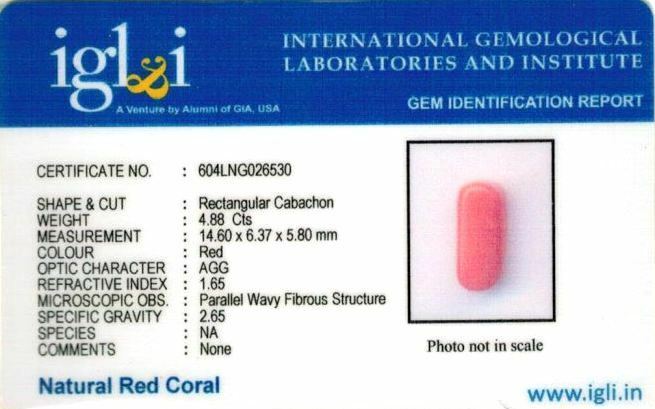 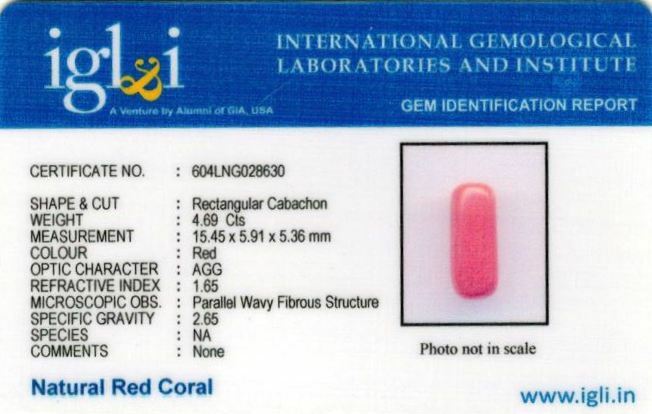 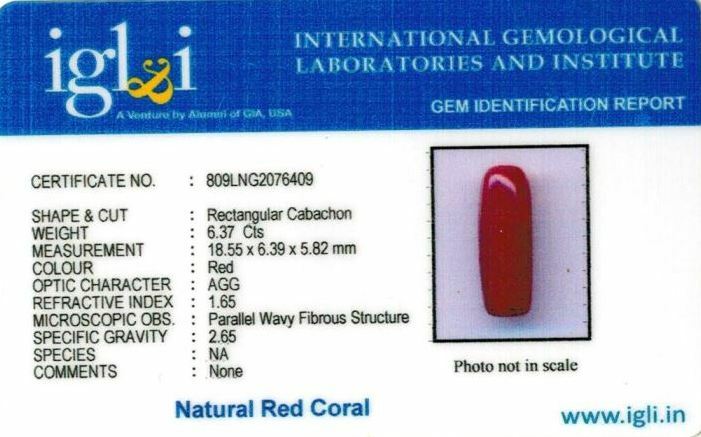 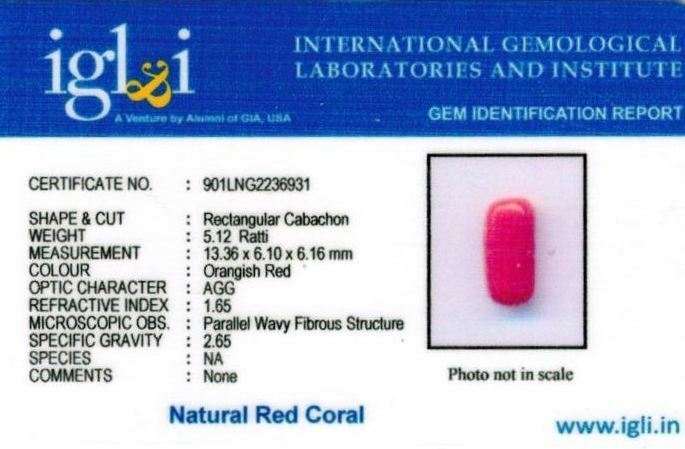 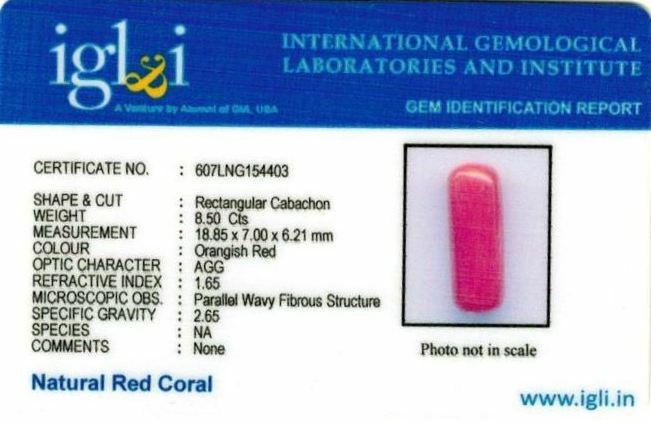 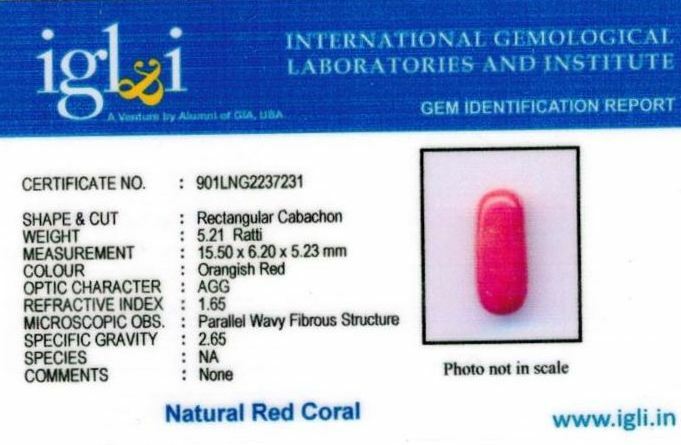 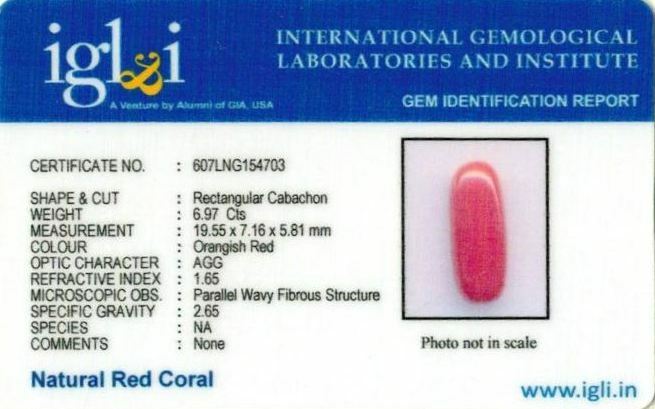 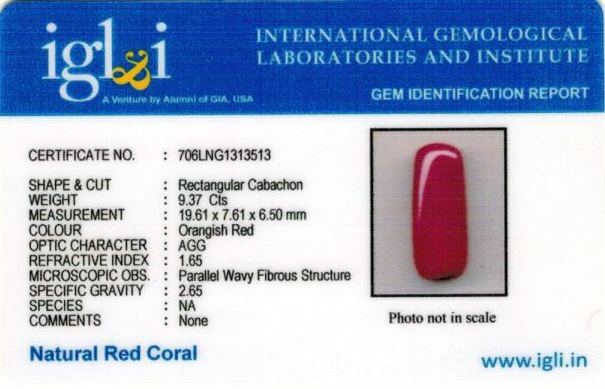 We deliver original lab certificate with red coral stone and same can be get verified from any lab, we are 100% responsible for certificate contents.